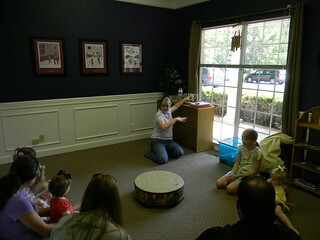 Where children with and without disabilities and their families can make musical memories together! *Therefore, all children can achieve basic music competence, which is defined as the ability to sing in tune and move with accurate rhythm. *The participation and modeling of parents and caregivers, regardless of their musical ability, is essential to a child’s musical growth. *This growth is best achieved in a playful, developmentally appropriate, non-performance-oriented learning environment that is musically rich yet immediately accessible to the child’s and the adult’s participation. *A rich, active music making experience! Music Together songs feature a variety of tempos, meters, and tonalities, designed to enhance children’s music learning and be interesting for adults. *Mixed age classes. Classes are designed so that every child can participate according to their ability level. Younger children learn by watching and imitating their older peers, and older children develop social and leadership skills. *Taught by teachers who have passed a rigorous three-day training course. Teachers also have access to ongoing professional growth opportunities and skills workshops. *Non-performance-oriented. We provide a playful atmosphere for learning where each child’s unique responses are encouraged and celebrated. Sitting still is not required! *Ten weekly 45-minute classes teaching a new song coll ection every fall, winter, and spring. Shorter summer semesters are also offered. *New professional recording each semester with new songs, rhythm chants, “play-alongs,” and tonal and rhythm patterns. Two copies – one for home, one for the car! You now get a digital download code as well! *Beautifully illustrated songbook with family activities to enjoy at home. *Music Together at Home: Helping Your Child Grow Musically – a complimentary booklet and DVD for new Music Together families. *Babies in Mixed-Age Classes Family Guide – complimentary booklet for families with infants under 9 months old in mixed age classes. *Semi-annual family newsletter and informative national website. *Parent education to help adults understand and enhance their child’s music development. *Returning families who register by early deadline will receive a free instrument for their family and be entered in a drawing for half off the next semester’s tuition. *Complete all nine song collections and receive a special gift for your family! All of our classes are for children with and without special needs. Because of the mixed-age nature of Music Together, it is a perfect avenue for inclusion of children with special needs. Our classes are taught by Dana Bolton, MEd, MMT, MT-BC, a board-certified music therapist who has 10 years of experience working with young children with special needs. Everyone benefits from inclusion – children with disabilities are surrounded by models of age-appropriate development, and typical peers develop friendships with children with disabilities and learn compassion for children with different abilities. If you have concerns about your child’s ability to participate in a Music Together class, please contact Bolton Music Therapy. Give the gift of music! Purchase a Music Together gift certificate by clicking here! We are not currently running Music Together classes. Sign up for our newsletter to be notified when we relaunch! Check out the fun we’re having!